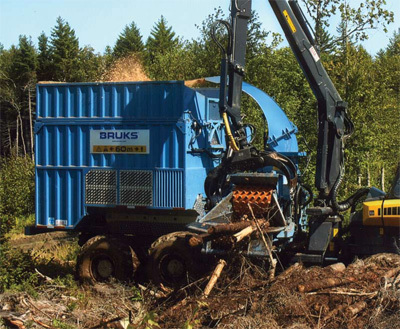 Nova Scotia's Robin Barrett sees a bright future for biomass, and has invested in that future with a Bruks chipper/Ponsse forwarder team for his in the woods chipping operation. Logger Robin Barrett is excited by the opportunity he sees for biomass development in Nova Scotia. His confidence in the future growth of biomass led Barrett Enterprises to recently make a major investment in a Bruks chipper/Ponsse forwarder team for their in-woods chipping operations. "This new unit is a major investment for our company, but as world oil prices increase and society looks for alternative energy sources, sustainable harvesting of biomass continues to have terrific potential," explained Barrett. "Our forests provide an amazing resource for forestry and biomass as long as we take a balanced approach to managing the resource." Barrett explained that his enthusiasm for biomass was boosted through attending the World Bio-Energy Conference in Sweden in May 2008.
production. In Sweden, almost every small town has a district biomass heat system. The wood chip biomass system makes them more self sufficient and gives them better control over the cost of living. "If we can keep the price of oil from causing our cost of living from going up, we could compete better internationally. I see biomass, in particular wood chips, as a winning solution, better for the environment, better for communities, better for society in general and it would make us more competitive." At this point, he notes, one of the largest challenges is that while there are numerous small woodchip burners available in Europe, it is hard to find units that meet Canadian manufacturing standards. Supplying the wood chips is Barrett's' new Bruks chipper, which follows a time-tested horizontal cylindrical twin knife chipper design, with a 450 horsepower Scania engine and a 21 cubic metre, side dumping chip bin. The chipper is mounted on a conventional Ponsse Buffalo King double bogie forwarder supplied through ALPA Equipment in Truro, Nova Scotia. Barrett's equipment inventory includes two Bruks-Rottne mobile chippers, two BWS 46-foot and one Manac 48-foot chip trailers with Keith walking floors, a 1997 Western Star tractor, three Rottne Rapid forwarders, plus two service trucks. "We keep our gear a long time," Barrett says. "The longer you keep it, the more important it is to pick the right gear at the start. "We are looking forward to a little less repair with the newer chipper," Robin says, smiling. Mike Barkhouse has more than 20 years' experience operating Bruks-Rottne mobile chippers, starting on Barrett's first chipper in 1986. Barkhouse says the new machine has some significant improvements that will markedly improve production rates. "With the new machine, I'm producing four to five bin-loads, and filling the highway trailers in only an hour-and-a-half to two hours, which is quite an improvement over the older chippers," said Barkhouse. "The new carrier has a few things to get used to," he adds. "The new chipper has a computerized feed system and the dumping system is a lot more refined. I expect that my load cycle times will shorten, but we're already seeing a big fuel saving with the new machine." Supplying wood chips for the Barrett operation is a new Bruks chipper, equipped with a 450 horsepower Scania engine and a 21 cubic metre, side dumping chip bin. The old Bruks chipper was 250 horsepower and the new one is 450 horsepower, and the Ponsse carrier is heavier and has more power. "But the engine technology has brought us big fuel efficiencies. With the old machine, we consumed 220 litres while filling two trailers. With the new machine we consume only 180 litres while filling three trailers." Barrett's older Bruks chippers had a side dumping bin that disgorged its entire contents in the trailer as the dumping process lifted it over the tipping point. The new machine has a double cylinder dumping system that allows the operator to control the entire dumping process. This allows them to manage the tipping movement, and move the forwarder to spread the bin load along the top of the trailer, filling it to maximum capacity. Barrett says the impeller discharge system of the new chipper will be a big improvement. "The old chipper had a blower which generated a lot of dust which created a severe fire risk when it landed on the chipper engine. The new impeller system appears to have eliminated a lot of that risk." 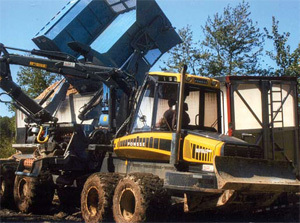 Barrett defends the in-woods chipping and dumping into parked trailers system, as opposed to chipping directly into trailers, from an operational efficiency point of view. "We could very easily pile down the wood adjacent to the road and load trailers directly from the chipper," he says. "However, that would mean the road would be blocked for all other forestry and trucking operations while we filled the trailer. delivery in a very short time so their trucking efficiencies are improved. "Our self-unloading trailers are important for serving small customers who don't have truck dumpers. On the other hand, the high tare weight of walking floor trailers becomes a disadvantage when delivering to plants that have truck dumpers" said Barrett. "Most of our customers have limited storage capacity so we pretty well supply a just-in-time delivery system. Through the winter, supply becomes a greater challenge with customers requiring higher volumes and our woods operations facing mud and snow, which slows production. "Most of our small customers have been with us since we started chipping and that type of loyalty means a lot to us--we are in business for the long haul." said Barrett. In addition to forestry biomass, they have also sourced chips from land development. Being centred in a metropolitan area, the in-woods chippers are used on land clearing for residential developments, roads, various rights-of-ways and building lots. The Barretts also employ chippers for highway and pipeline clearing projects and land clearing for agricultural development. In forestry operations, the forwarding operation has a big impact on the efficiency of the chipping operation. "The amount of dirt and rocks that the forwarder operators get in the wood translates into how often we have to change the chipper knives and how fast I can fill the trailers," explained Barkhouse. In suburban areas, Barrett said spikes and nails in trees--and virtually every kind of metal debris on the ground--has the potential to dull knives, flatten tires and slow production. Three generations of Barretts: Robin, Rilla and David Barrett. 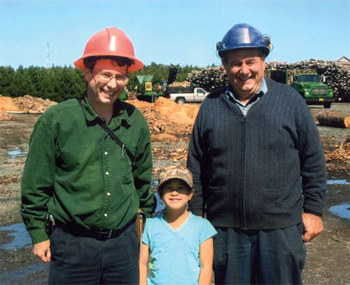 David Barrett began working at the family-owned sawmill at the age of 10 and continues to have an active interest in the business--and biomass--at the age of 70. By piling biomass in forestry operations, Barrett gets an advantage from natural drying processes. "Biomass chips have several advantages," he says. "Not only is it dryer from sitting for several months, but the chipping process also cuts the wood rather than crushing it, which creates a product that is much less prone to reabsorbing moisture. Customers are usually willing to pay a premium for chips for this reason." One of their customers calls it the "Rocket Fuel" of the biomass industry. "A higher degree of consistency in size and moisture content allows the chips to burn faster and hotter than many other biomass products. Our customers often mix chips with other higher moisture biomass products to improve the efficiency of their burners." With long term sustainability as a personal value, Barrett is concerned about the potential of nutrient loss related to biomass removal. "We are a forestry company, and sustainability of the forest resource is a primary concern. It is certainly not in our best interest to deplete forest soil fertility. If the site is not identified for development, we leave the slash or let it dry before we chip it, which allows the leaves and needles to drop. Current research identifies the highest nutrient levels in the leaves and needles, followed by the bark and lastly by the stem. "While we still have much to learn on this subject, we are benefiting from research done by the Europeans who have been using biomass much more aggressively for over two decades. We have the luxury of learning from other's mistakes rather than having to make them ourselves." Summarizing their operations, Barrett said keeping up to date with the state of the industry and sharing solutions are tasks for business success. They enjoyed the benefit of the Bioenergy Conference and Demo 2008 which were held last year in Halifax. Having organizations like the Canadian Woodlands Forum, Canbio, FPInovations and Natural Resources Canada share the most recent research and best practices on environmental and operations issues is an important benefit for the industry, he believes. "This Bioenergy Conference dispelled any doubt I had about going with a forwarder mounted chipper. While I might be jealous about the high production rates of large horsepower machines, the logistics to keep them producing efficiently does not fit with the flexibility and low impact operation we pride ourselves in." New lumber player Conifex recently decided to re-start its Fort St. James, B.C. sawmill, a move that required some extensive prep work since the mill had been shut down for 16 months. R. Bruce Erickson Construction has taken on some challenging harvesting jobs with the very capable support of their Cat equipment, including the first Cat 551 feller buncher sold in Western Canada. Contractor Randy Mattson is using a newly purchased Hitachi ZX2 10F-3 Forester as the foundation for expanding his operations in the forest industry. Alberta's Camps Lumber is succeeding in sawmilling thanks to staying in close touch with their current customers--many of those customers being in the still busy oilpatch--and keeping an eye out for new opportunities. Get the lowdown on new features and technology with Logging and Sawmilling Journal's Tech Update on wheel loaders. Tony Kryzanowski on how Canada can help China with its energy challenges--with Canadian biomass.